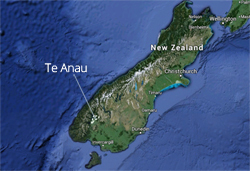 Te Anau and Manapouri may be small communities, but we are blessed with some interesting museums and visitor centres, and places to book your trips. There is an i-site on the waterfront (pictured above) and Adventure Fiordland (halfway down the main street with a yellow kayak on the roof) is also an excellent information and bookings centre. The wonderful DOC visitor centre, a short walk along the lake front going south of the main street, is open daily. It has displays about the history, geology, flora and fauna of the region. Entry is free and you can also watch a free movie about Fiordland. There is also a Department of Conservation shop on the premises selling useful maps and a range of conservation-related gifts. A private collection of military vehicles and memorabillia. There are two big halls full of vehicles, and you could spend the whole day here. This museum is at the bottom of the Gorge Hill, on the Mossburn-Te Anau highway. Entry by arrangement. Call Duncan McGregor on 027 4813070 or Tina (03)249-5855 and 0272417486. You can also read our article about the museum here. A collection of vintage machinery including farm machinery on Sandy Brown Road. You can also walk around the old school house and see Tawera (pictured below); an amazing boat that cruison Lake Te Anau nearly for 100 years, from 1899 to 1996. Call to arrange an opening of the Fiordland Vintage Machinery Museum on 03 249 7054.